MEMBERS of the Royal Air Force Aerobatic Team, the Red Arrows, have been meeting young people taking part in a pioneering education and aviation partnership at Trent Valley Gliding Club in Kirton Lindsey. The ‘Aim for the Sky’ project will see 208 students from North Lindsey College FE/HE experience training flights as glider pilots under instruction, take part in briefings about the theory of flight, meteorology and navigation, and get involved with airfield operations. Pete Stratten, Chief Executive Officer of the British Gliding Association, said: “This partnership is a superb example of how gliding provides excellent groundwork for many careers, including aviation and aerospace, through engaging opportunities for young people linked to science, technology, engineering and maths (STEM). One of the key aims of the Red Arrows is to inspire people, including by showcasing the importance, and use, of STEM in aviation. 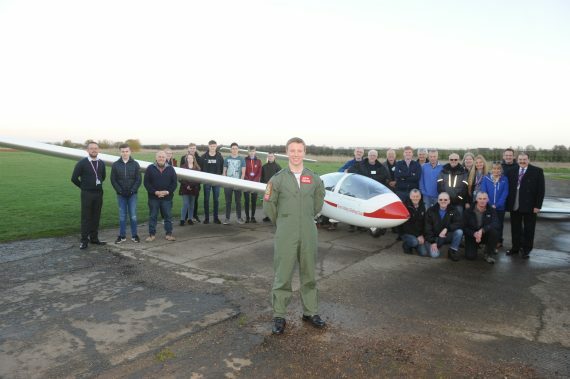 Flight Lieutenant Gregor Ogston, a former Harrier and Typhoon pilot, joins the RAF Red Arrows aerobatic team for the 2019 season as Red 4 and visited Trent Valley Gliding Club with Operations Officer, Flight Lieutenant, Adam Youle, to meet students on the course. Flt Lt Ogston said: “As one of the finest display teams in the world, the opportunity to fly with the Red Arrows has been something I’ve aspired to for many years. The Aim for the Sky programme will help raise aspirations and enable students to experience aviation from the perspective of pilot, ground crew, technicians and operations, realising the potential of individuals to succeed in an industry discounted by many as impossible. Flt Lt Youle, who is a gliding instructor on his days off from working with the Red Arrows, said: “Gliding provides opportunities for developing technical skills but also team working, communication and leadership, with many young people involved in the sport going on to a career in flying, engineering or other professional role within aviation and aerospace. The ground-breaking ‘Aim for the Sky’ project is funded under the umbrella of the consortia FORCE National Collaborative Outreach Programme (NCOP) and will last for two weeks per cohort until June 2019 involving a total of 208 students from North Lindsey College and local secondary schools. All the sessions will take place at Trent Valley Gliding Club Ltd based at Kirton in Lindsey in North Lincolnshire with each student being able to benefit from pilot tutoring over three free glider flights. Students will have a full 12 hours of experience both practical and theoretical over two weeks.